I’m Anouk and I’ve been an intern at the Science, Technology and Education (STE) section of the Swiss Embassy in Beijing for two weeks now. So far I can already look back to a very interesting and manifold time. Last week I had my first “official appearance as a representative of the Swiss Embassy”. 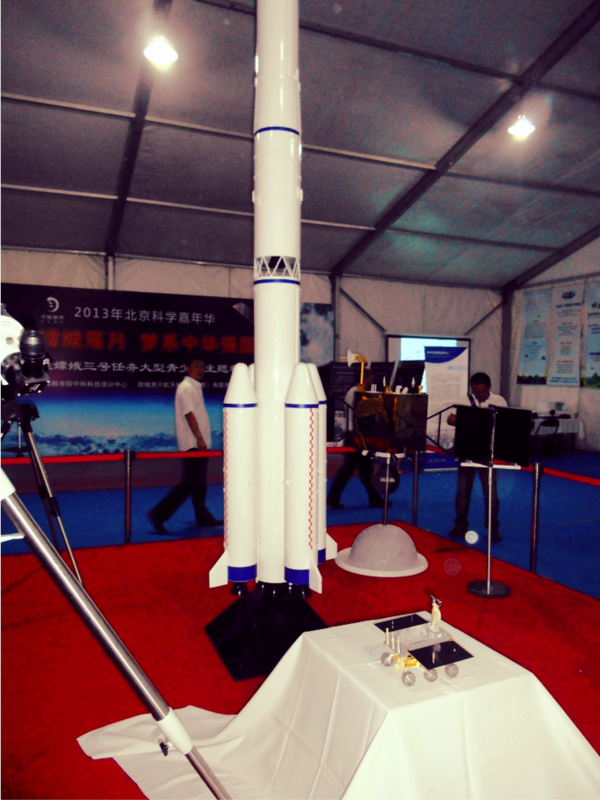 The occasion was the opening ceremony of the Beijing Science Festival (BJSF) at the Beijing Olympic Park. The BJSF took place from September 12th to September 16th, organized by BAST, the Beijing Association for Science and Technology. The aim of the annual Science Festival is to popularize science through interactive projects, demonstrations, forums and shows. Our section of the embassy got an invitation to attend the opening ceremony of the festival as well as a buffet prior to that. When I heard that I should go there all by myself, I was on one side looking forward to it, but on the other side very nervous, since I have never attended such an event before. There was a shuttle bus waiting for the invitees from the different embassies near the embassy district. Of course I did not exactly calm down when I saw that the other attendants were all men in a much higher position and with a lot more experience than me. After every one of us got his own volunteer appointed to, who should guide us through the evening, the bus took us to the buffet. I quickly calmed down when I experienced that the atmosphere was very informal and friendly. I had the chance to have interesting discussions with representatives of the Finnish, French and Malawi embassies about their embassies cooperation with China and about innovation in China. Although there weren’t any Chinese officials present, the way of connecting clearly had a Chinese touch. Most of the times even before the small talk started, business cards were exchanged, of course with two hands and a slightly bended head. Later we were driven to the exhibitions of the Science Festival at the Olympic Park. The exhibition was organized into different theme regions, like chemistry, nutrition and health or defense science. Especially interesting was the astronomy and space region, where the presentation of a lunar vehicle model took place for the first time in public. After the tour through the exhibitions, the opening ceremony took place, with colorful acts, shows and dance performances. Unfortunately it was disrupted by heavy rain, but of course the volunteers anticipated that and had umbrellas ready for us. So all in all I had a really interesting evening. The different way of interacting with people (although maybe less formal compared to Europe, but on the other side more formal with important procedures like the exchanging of business cards), the perfectly organized evening (everything went exactly after timetable, everyone had his own guide), the very colorful performance at the end, this was all very new for me. I definitely look forward to my future tasks at the embassy.